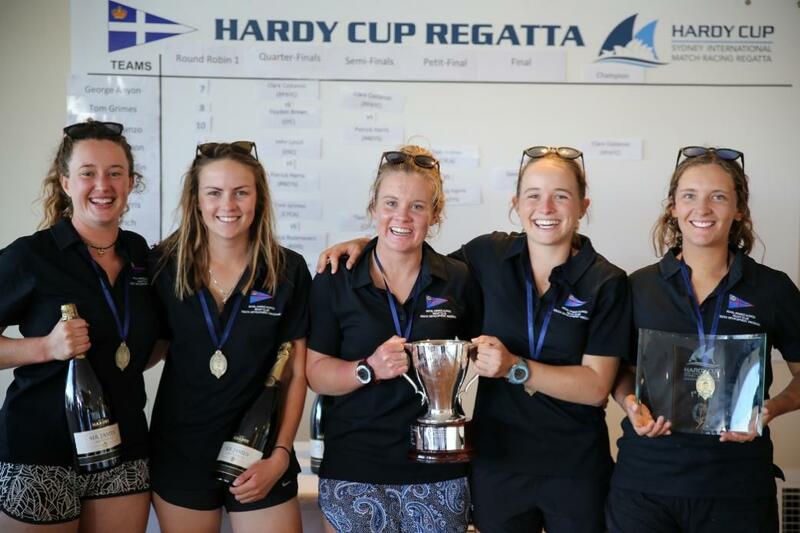 Clare Costanzo and her team of Jess Angus, Ruby Scholten, Celia Willison and Hannah Lanz have won the 2018 Hardy Cup! This is a historic win as not only has Clare become the first female skipper to get her name on the trophy, in addition the team is also the first all female team to do so since since its inauguration in 2001. The Royal Prince Alfred Yacht Club (RPAYC) was represented by two teams at the Hardy Cup 2018 this week, both skippered by the Costanzo sisters Clare and Juliet. On Clare’s team was Jess Angus, Ruby Scholten, Celia Willison and Hannah Lanz. On Juliet’s team was James Farquharson, Annalise Scholten, Sam Thomas and Rachel Bower. Hosted by the Royal Sydney Yacht Squadron, and considered one of Australia's most prestigious match racing events, the Hardy Cup, is an Under 25 World Sailing Grade 3 International Event. The Hardy Cup was donated by Sir James Hardy (Event Patron), the America's Cup, World Champion and Olympic Yachtsman, and prominent RSYS member to promote the match racing helming skills and tactical skills of young sailors. The 2017 Australian Sailing Coach of the Year Tom Spithill spent the week on-water supporting his two RPAYC crews, the other helmed by Clare’s younger sister Juliet. On Friday morning, February 9th, he woke up in Auckland where he will coach and mentor two different teams fielded by his club for the Nespresso Youth International Match Racing Cup, February 9 - 13. 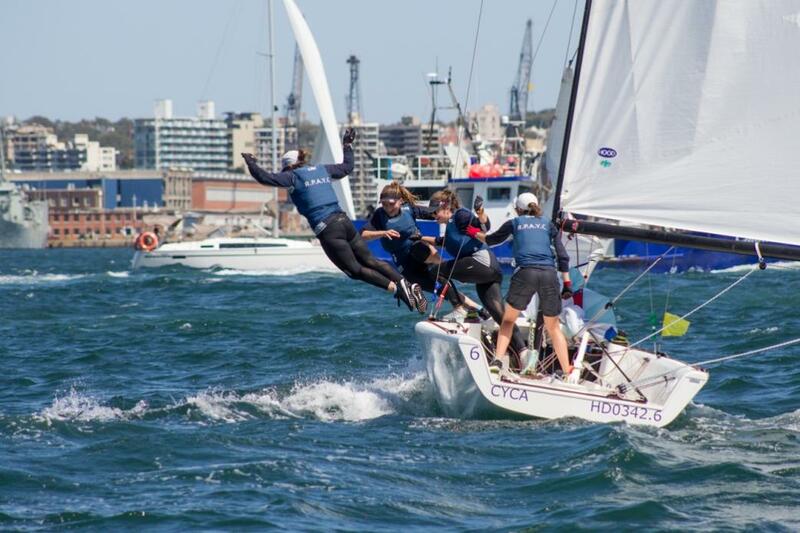 The RSYS’s next major event is the Etchells NSW Championship which will play out February 16-18 on Sydney Harbour. Twleve teams took to the waters just off the RSYS clubhouse on the 5th of February. They represent: Royal Freshwater Yacht Club, Royal New Zealand Yacht Squadron, Royal Port Nicholson Yacht Club, Sandringham Yacht Club, Darwin Sailing Club, RPAYC, CYCA and RSYS. On Day 1 Clare and team suffered their first and only loss of the day in their first race, with Tom Grimes (CYCA) getting the better of them off the line, and the girls struggling to read the wind as the sea breeze tried to stabilise. It was onwards and upwards from their as they won the next 6 races, placing them in 2nd place overall after day 1. Juliet and team had a promising day, considering this is Juliet’s first time helming at a Youth Match Racing regatta. Juliet managed to start well and was getting around the track in good shape. “All our Matches were really close, and I was really impressed with our team dynamics. Being my first regatta, their were a lot of mistakes...however I hope to learn from these mistakes, and try not to repeat them!” said an excited Juliet Costanzo. Juliet was sitting on three points, with wins against the CYCA, RFBYC, and RSYS. Hardy Cup 2018 - Juliet Costanzo crew, -1! Juliet Costanzo finished in 10 overall, again winning 3 races. A great first hitout for the RPAYC skipper-sailor. The Semis and Finals will be held tomorrow, Thursday 8 February. The Semis are done: it's Tom Grimes CYCA vs Patrick Harris RNZYS in the Petit and George Anyon RNZYS vs Clare Costanzo RPAYC in the Finals!